An injured person is carried in Barcelona, Spain, Thursday, Aug. 17, 2017, after a white van jumped the sidewalk in the historic Las Ramblas district, crashing into a summer crowd of residents and tourists and injuring several people, police said. Spain's public broadcaster, RTVE, is reporting that regional police troopers have killed four people and injured another. However, Major Josep Lluis Trapero of the Catalonia region's police force says the driver is not thought to have been involved in the van attack that killed 13 people earlier Thursday night. Trapero says the dead driver "doesn't have any connection with the terrorist attack we are investigating." Hours after the van attack on a downtown pedestrian plaza, the police force for Spain's Catalonia region had said that a car hit two officers at a traffic blockade on the outskirts of Barcelona. That's when the driver was shot and killed. Rajoy traveled to Barcelona following the van attack that killed 13 people and injured up to 100. He says the victims and their family and friends "are in this moment our main priority." The capital of Spain's Catalonia region was "today hit by jihad terrorism like other cities have been throughout the world." For Spain, Thursday's bloodshed was the country's deadliest attack since 2004, when al-Qaida-inspired bombers killed 192 people in coordinated assaults on Madrid's commuter trains. The interior chief for Spain's Catalonia region says three days of mourning have been declared to honor the victims of the van attack that killed 13 people in Barcelona. 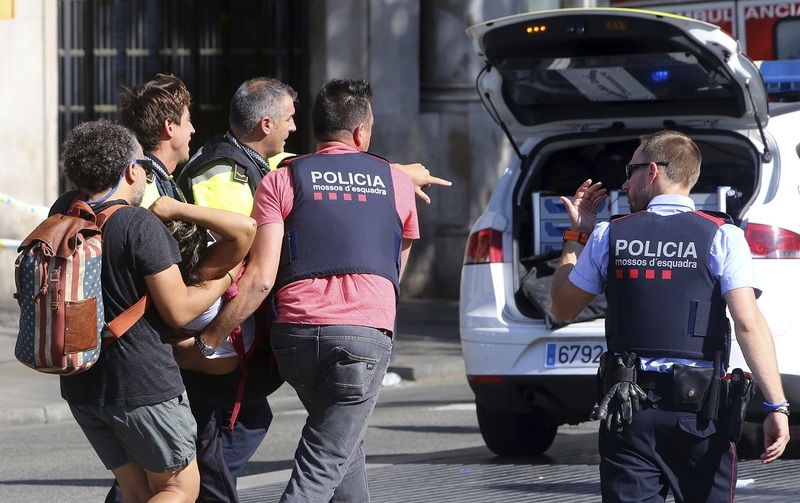 Senior police official Josep Lluis Trapero says the van driving up onto a sidewalk and swerving among pedestrians in a crowded area was "clearly a terror attack intended to kill as many people as possible." Trapero says the two suspects in custody were directly linked to the attack, "but that doesn't mean that either were the author of the attack." The government in Spain's Catalonia region has revised the death toll from the van attack in Barcelona back up to 13. Catalonia's regional president, Carles Puigdemont, tells Barcelona broadcaster TV3: "Our priority is to save lives. And our second priority is the police investigation, to find the people responsible of this attack and anyone who has helped them directly or indirectly." Prime Minister Charles Michel tweeted that "no barbaric act will undermine the power and resilience of our ally." Foreign Minister Didier Reynders noted that one Belgian national had been killed in the attack, and he sent his government's condolences to the victim's family. Belgian federal police, whose officers have been working extra duties as the country has been on high alert for more than a year, also said that "our thoughts are with the people of Barcelona and all our Spanish emergency services colleagues." Greece's foreign ministry says a Greek woman has been injured in the van attack in Barcelona. It didn't say how severe the woman's injuries are. A statement carried by the extremist group's media arm — the Aamaq news agency — says Thursday's attack was carried out by "soldiers of the Islamic State." The police force for Spain's Catalonia region says a car knocked down two police officers at a traffic checkpoint in Barcelona. 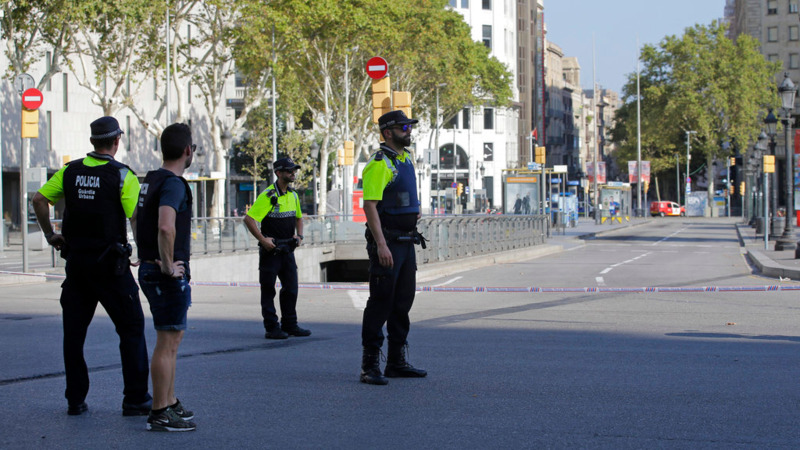 The Mossos d'Esquadra force did not indicate if the incident was related to the van attack in the city's Las Ramblas district on Thursday that left 12 people dead and dozens injured. The president of Spain's Catalonia region says police have arrested two people in the van attack in Barcelona's bustling Las Ramblas district. The region's interior minister had tweeted earlier that 13 people had died in the attack. Barcelona Mayor Ada Colau says a moment of silence will be held in the city's main square at noon Friday "to show that we are not scared and we are more united that ever." Spain's royal palace has condemned the deadly van attack in Barcelona, calling the perpetrators "assassins, simply criminals who will not terrorize us." A speeding van struck pedestrians in Barcelona's Las Ramblas district, killing at least 13 people and injuring more than 50 others. The royal palace's statement, which was posted on Twitter, also said that "All of Spain is Barcelona. Las Ramblas will once again be for all." In a separate tweet, Prime Minister Mariano Rajoy said that "the terrorists will never destroy a united people who love liberty over barbarism. All of Spain is with the victims and families." Vatican spokesman Greg Burke says the Argentine pope was "greatly worried" about Thursday's attack and is following developments closely. The Vatican has greatly increased security for Francis' public events to prevent similar truck assaults on crowds that throng to his weekly audiences and Sunday blessings in St. Peter's Square. Britain's prime minister says that the "the U.K. stands with Spain against terror" following the van attack in Barcelona that killed at least 13 people and injured dozens of others. Theresa May condemned the "terrible" attack in which a speeding van struck pedestrians in Las Ramblas. The attack in Barcelona comes after similar vehicle attacks in London this year. European Commission President Jean-Claude Juncker, meanwhile, said it was "with profound sorrow and anguish that I have learnt of the terrorist attack that has struck at the heart of Barcelona this afternoon." He added: "This cowardly attack has deliberately targeted those enjoying life and sharing time with family and friends. We will never be cowed by such barbarism." France's president and the mayors of Paris and Nice are among the French dignitaries offering support for Barcelona after a deadly van attack. French President Emmanuel Macron tweeted Thursday evening: "All my thoughts and solidarity from France for the victims of the tragic attack in Barcelona. We will remain united and determined." Nice Mayor Christian Estrosi, whose Mediterranean city lost 86 people in a truck attack during a Bastille Day fireworks display a little more than a year ago, announced that a special homage to Barcelona's victims would be held Friday. Paris Mayor Anne Hidalgo, a Spanish native whose city has faced multiple Islamic extremist attacks in recent years, expressed her "sadness and indignation." Trump also says in a statement on Twitter that the U.S. will do "whatever is necessary to help." Trump tells Spain: "Be tough & strong, we love you!" Trump's wife, first lady Melania Trump, tweeted her "thoughts and prayers" to Barcelona before the president. At least 13 people were killed and at least 50 injured after a van was driven onto a sidewalk and down a pedestrian zone in Barcelona's historic Las Ramblas district. Catalan Interior Minister official Joaquim Forn also said on Twitter that more than 50 people were injured during Thursday's attack. The move came right after police announced they had arrested one suspect and were "treating him as a terrorist." Speaking to reporters at the State Department shortly after a van plowed into a crowd, Tillerson said the incident "has the hallmarks of what appears to be yet another terrorist attack." He said "terrorists around the world should know that the United States and our allies are resolved to find you and bring you to justice." The police force for Spain's Catalonia region says it has arrested a man in the Barcelona van attack and is "treating him as a terrorist." The tweet said: "There is nobody held up in any bar in the center of Barcelona. We have arrested one man and we are treating him as a terrorist." Meanwhile, the region's interior minister is calling on residents to remain indoors and avoid unnecessary travel while the investigation continues. Spain's public broadcaster says a suspect in the Barcelona van attack has been arrested. It wasn't clear if that person is the man who was arrested. Barcelona's Tv3: also reported Thursday that the Spanish passport of a person of Moroccan origin was found at the scene of the attack that police say has left at least one person dead. Police haven't confirmed they have a suspect cornered. Barcelona's El Pais newspaper reported earlier that police were seeking more than one suspect in an unnamed bar. A government official in Barcelona says one person has been confirmed dead and 32 others injured in the van attack in the city's historic Las Ramblas district. Catalonia's regional interior chief Joaquim Forn said during a news conference on Thursday: "Unfortunately the number of fatalities will likely rise." Trump is on a working vacation at his private golf club in Bedminster, New Jersey. His wife, first lady Melania Trump, sent her "thoughts and prayers" to Barcelona via Twitter. Police in Spain have confirmed fatalities after a van slammed into pedestrians in Barcelona's historic Las Ramblas district. A van slammed into pedestrians on Thursday in Barcelona's historic Las Ramblas district, which is normally packed at the height of the summer tourist season. Catalan police said: "We confirm the terrorist attack. The protocol for terrorist attacks has been activated." He says he saw "women and children just running and they looked terrified." Fleming heard a bang, possibly from someone rolling down a store shutter, as more people raced by. Fleming says: "It's just kind of a tense situation...."Clearly, people were scared." Police in Spain have confirmed there are fatalities after a van slammed into pedestrians in Barcelona's historic Las Ramblas district. Catalan police tweeted that "there are mortal victims and injured from the crash" without specifying numbers. The Barcelona-based La Vanguardia newspaper is reporting at least one dead and 20 injured. A van jumped the sidewalk in Barcelona's iconic Las Ramblas area, slamming into pedestrians. At least five were seen lying on the ground on the popular tourist street. El Pais newspaper, citing unnamed police sources, says the two perpetrators are holed up in a bar in central Barcelona. Various local media reports have called it a terror attack, but authorities haven't officially confirmed it. Spain's El Pais newspaper says that Barcelona police are treating the van crash as a terror attack. Barcelona police, in a tweet, told people to stay away from the center of the city because of a "large contingent of security forces and emergency services" deployed in the area. Spain's El Pais newspaper, citing police sources, says the two perpetrators of the van crash in Barcelona are holed up in a bar. 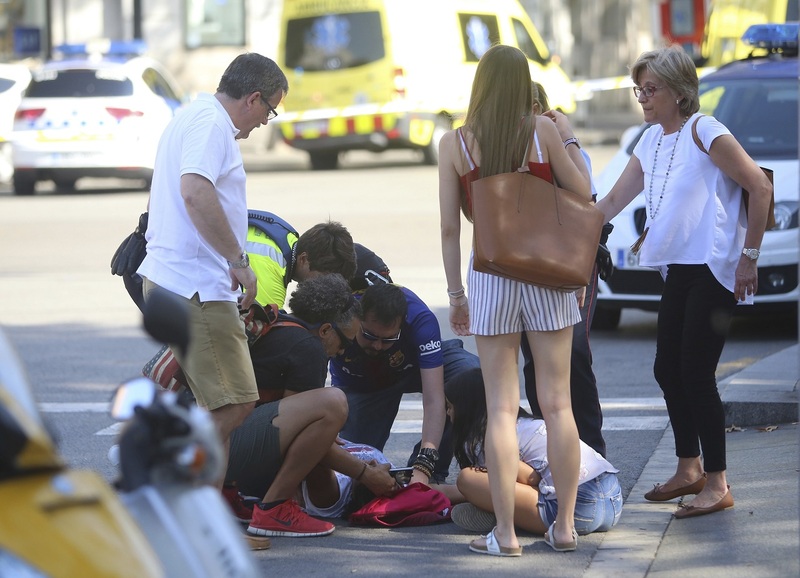 A white van jumped the sidewalk in Barcelona's historic Las Ramblas district on Thursday, crashing into a summer crowd of residents and tourists and injuring several people, police said. Police in the northern Spanish city of Barcelona say a white van has jumped the sidewalk in the city's historic Las Ramblas district, injuring several people. Las Ramblas, a street of stalls and shops that cuts through the center of Barcelona, is one of the city's top tourist destinations. People walk down a wide, pedestrianized path in the center of the street, but cars can travel on either side. Police in the northern Spanish city of Barcelona say a white van has jumped the sidewalk in the city's historic Las Ramblas district.